2010 LEONIDS: BACK TO NORMAL The leonid storm season has ended, with the next outbursts not predicted until around 2028. That means, for now peak rates will be around 12 an hour in the early morning hours. To see the expected rate from your location, go here, and select the shower "Leonids" and the date of the observation (around Nov 17-18). Update Nov. 12: Nepalese astronomer P. Atreya is organizing an international ground-based observing campaign near Kathmandu, Nepal, where he will be joined by P. Jenniskens, J. Vaubaillon, and others. First reports will be posted here. 2007 LEONIDS, FIRST IMPRESSION A crystal clear night here in N. California resulted in these two Leonids being captured in one image. The bright light in the east is Venus. The Leonid ZHR on Nov. 18 9:30-13:30 UT was measured at 23 +/- 4. 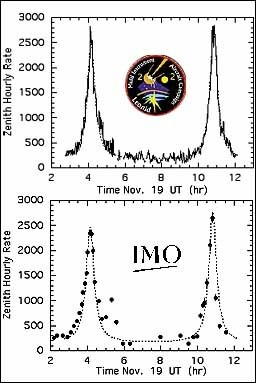 The International Meteor Organization reports that rates continued to increase and has reached ZHR ~ 42/hr over Europe in the night of Nov. 18/19. This is stronger than expected for the annual Leonid shower and shows that the Filament component has returned. Sadly, we will not be able to confirm the high rates in N. California, because of overcast skies tonight - Peter Jenniskens. See also this Taurid meteor of Nov. 18 11:03:54 UT and comet 17P/Holmes. Many of our meteor showers such as the Taurids may have originated in a process of fragmentation similar to that experienced now by 17P/Holmes. Location of comet Tempel-Tuttle's dust trails at Earth orbit in November 2007 in calculations by Jeremie Vaubaillon (Caltech). 2007 LEONID FORECAST Earth will have an encounter with the 1932-dust trail of comet 55P/Tempel-Tuttle on 2007 November 18 at 23:03 UT, according to Jeremie Vaubaillon (Caltech). Esko Lyytinen of Finland put the peak time earlier at 22:36 UT. Meteors would radiate from R.A. = 154.0 deg., Decl. = +21.4 deg., at geocentric speed of 70.9 km/s, according to I. Sato. The trail encounter is similar to that last year and peak rates are expected to be less, somewhere around ZHR = 30 /hr. The outburst will last only 1-2 hours (FWHM about 0.68 hours, according to Jenniskens 2006). What you can see. 2005 LEONID FORECASTING The 2005 Leonids are expected to show only moderate activity this year, with only one possible trail encounter on November 21, at around 01h UT. This encounter was first pointed out by M. Maslov and concerns a very perturbed old trail ejected in A.D. 1167. Rates will be low. Nevertheless, it is important to try to confirm this encounter. More information here. 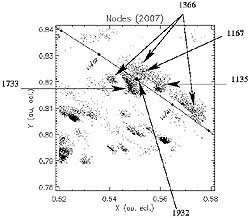 2004 LEONIDS: FIRST REPORTS First reports indicate elevated Leonid rates on Nov. 18/19. At Fremont Peak Observatory in California, where Mike Koop, Jeremie Vaubaillon and Peter Jenniskens observed, Leonid rates rose to about 20/hr at 11h UT before fog rolled in. Bob Lunsford reports peak rates of 30 and 28/hr from southern California. This is up from the expected 5-10/hr of annual shower activity at that time. We suspect this is the "Filament" component. Leonids were active too in the previous two nights. It is not clear yet if the various predicted dust trail encounters were seen. 2004: TOUCHING ON THREE DUST TRAILS NOVEMBER 8 + 19 The latest news is a possible dust trail encounter from dust ejected in 1001, expected to peak at 23:30 UT Nov. 8. More information here. For November 19, Jeremie Vaubaillon, Esko Lyytinen, Markku Nissinen, and David Asher have arrived at a common prediction for this year's 2004 Leonids. It was found that Earth will pass close to two dust trails, those of 1333 and 1733. Any outburst from the 1333 trail will peak at 06:42 UT, November 19, well positioned for U.S.A. observers. Rates will not be high, ZHR = 10 at best. The second 1733 trail will arrive at 21:49 UT, when the rates can go up as high as ZHR = 65. That outburst is best seen in Asia. Even though rates will not be as high as in past Leonid storms, it is important to continue observe these showers to learn how dust is distributed by the parent comet 55P/Tempel-Tuttle. More information here. CHANDRA HIT BY LEONID? The Chandra X-Ray observatory reports a hit by a meteoroid on November 15, 2003. More here. 2002 LEONID ORBITS MEASURED Josep Trigo-Rodriguez and colleagues present ten meteoroid orbits from the 1767 dust trail in a recent issue of Icarus (171, p. 219), based on results from the Leonid MAC supporting ground-based campaign in eastern Spain. There is good agreement between theoretical orbits from the 1767 ejecta of 55P/Tempel-Tuttle and the observed meteoroid orbits. FIRST RESULTS 2003 LEONIDS The first reports on the 2003 Leonid shower are posted here. The 1499 dust trail (about 17h UT on Nov 13) was apparently confirmed by Japanese visual observers, albeit not as intense as predicted by Esko Lyytinen. A broad peak (the "Filament") with ZHR about 50 was observed around November 19, as predicted by Peter Jenniskens. 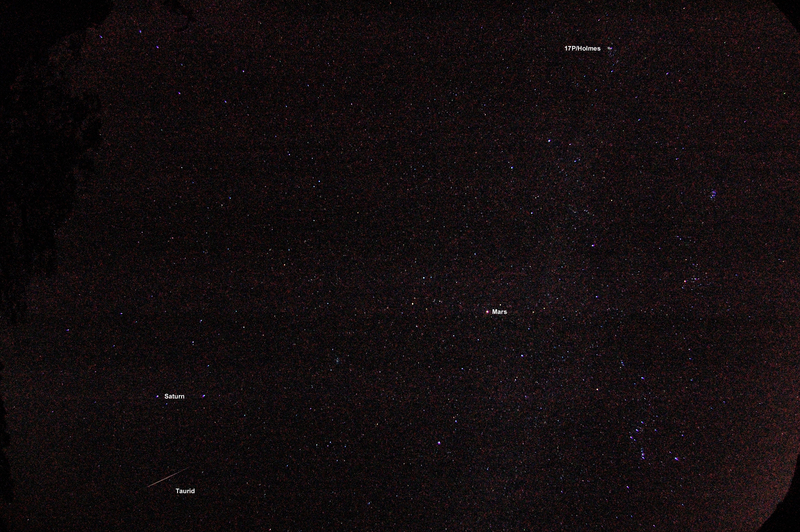 Other minor trails at 7h UT (1533) and 17h UT (1733) could not (yet) be confirmed due to lack of data. Clouds interfered with many observing plans. LATEST ON PROSPECTS FOR 2003 LEONIDS This year's Leonids will not see a repeat of the storms of past years. That said, there are two outbursts predicted that offer exciting opportunities for viewing. Esko Lyytinen predicts that on November 13 (~ 16h UT), Earth will cross the dust trail ejected in 1499, six days prior to the main maximum! Peter Jenniskens and Hans Betlem predict that on November 19, there will be a broad Perseid-like shower of bright Leonid meteors lasting about a day. Jeremie Vaubaillon points out that at 07:27 UT that day an old dust trail from 1533 will be near Earth orbit. Overview of expected activity. The 1999 Leonid storm from 39,000 ft.
FLUX ESTIMATOR UPDATE Dec. 2007 - It is now possible to calculate the shower activity from your local observing site for all established meteor showers in the IAU List of Established Showers. The number in front of each stream is the official IAU shower number. Go to: Fluxtimator applet. 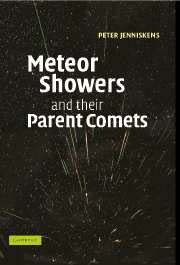 REPORT OF LEONID MAC MISSION RESULTS Cambridge University Press has published a 790 page book "Meteor Showers and their Parent Comets" by Leonid MAC principal investigator Dr. Peter Jenniskens. The book contains meteor outburst predictions for the next 50 years and much new information about the association of meteor showers with newly discovered Near Earth Objects. It is an academic overview of the field of meteor astronomy, the first since Lovell's 1954 book "Meteor Astronomy", but written so that it can be used by both amateur and professional astronomers interested in chasing meteor outbursts. 2003 + 2006 LEONID OBSERVING CAMPAIGNS Now the storms are over, there will be no more Leonid MAC missions. A number of potential smaller meteor outbursts are predicted for the years 2003 - 2007. Each encounter will shed more light on the distribution of dust in the trails, especially in old trails and those parts of trails caused by grains ejected with large initial ejection speed or those experiencing unusually high radiation pressure. We work to organize ground-based observing campaigns to provide ground truth for the further development of dust trail models. 2006: Ground-based observations planned for Spain. Observations executed under clear sky conditions. 2003: Ground-based observations at Fairbanks, Alaska. 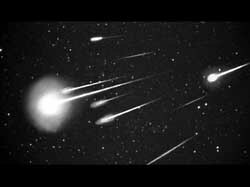 High framerate images of Leonids in days before the peak. Peak clouded out. 2003 LEONID MAC WORKSHOP On August 28-30, participating researchers and other workers in the field compared notes on the 2002 Leonid storms at the 2003 Leonid MAC Workshop at NASA Ames Research Center (CA). The "shock" in meteor images has been confirmed. 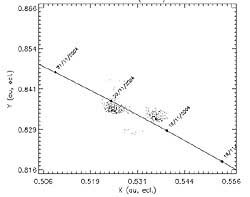 The organic signature reported during the 1999 mission in infrared spectra is confirmed. There turns out to be a large diversity in comet meteoroid composition and morphology. New molecules have been detected in meteor emissions, and there is now an answer to the long standing mystery of persistent trains. A report with much more news will follow. 2002: NASA/DC-8 Airborne Laboratory crew and scientists. 2002: USAF/FISTA crew and scientists. (photos courtesy Eric James, code JIT, NASA Ames). 2002 LEONID MAC CAMPAIGN REPORTS AND IMAGES The NASA and USAF sponsored 2002 Leonid MAC mission was a great success. Both aircraft were above clouds and under perfect conditions for viewing both of the 2002 Leonid storms enroute from Torrejon, Spain, to Offutt AFB near Omaha, Nebraska. All instruments worked as expected and aurora, moon, and meteors made the view scenic and truely spectacular at times. 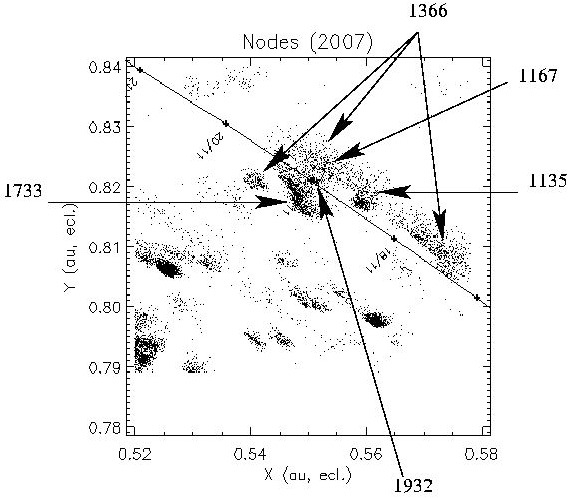 2002 Leonid flux measurements from the air (top) and ground (bottom). 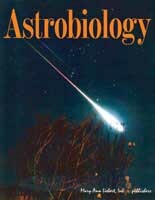 SPECIAL LEONID MAC ISSUE OF JOURNAL ASTROBIOLOGY The journal Astrobiology has changed its traditional front cover to feature one of the spectacular fireballs photographed during the 2001 Leonid shower. This one by Kris Asla from Aloha, Oregon. The publisher, Mary Ann Liebert Inc., agreed to the change after this picture was submitted as possible cover art to go with a series of five papers, presenting results from the 2001 and 2002 Leonid MAC missions: studies of the plasma temperature and temperature decay in the wake of meteors and studies of CN, OH, and H emission that probe the exogenous delivery of organics and water.